Nichole is a South Dakota native raised in a construction, farming & ranch family with a fond appreciation and an immense respect for our lands. She enjoys the outdoor adventures of biking, fishing, hiking and hunting while cherishing the gift of time with her husband & two sons. With a degree in Environmental Science and Rural and Urban Development , Nichole has continually worked towards a healthy balance between growth and preservation in various positions within the private and public sectors. Nichole is a strong advocate for community involvement, volunteering and serving on numerous committees and foundations. 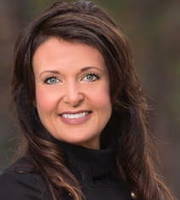 Along with her husband, Nichole started Big Mountain Homes & Development in Wyoming. Big Mountain specializes in custom farm and ranch, single family homes throughout South Dakota, North Dakota, Montana & Wyoming. After years of home projects, Big Mountain Development & Homes expanded into an additional sales location in North Dakota as well as completing single family and multi-family development in McKenzie County, ND. Nichole's attention to detail, perserverance & work ethic, enables her to provide her buyer clients with the pertinent information necessary to attain the clients aspirations of a quality family home and/or the precise parcel of land, as well as professionaly representing the seller clients with specialized marketing campaigns customized to each property.